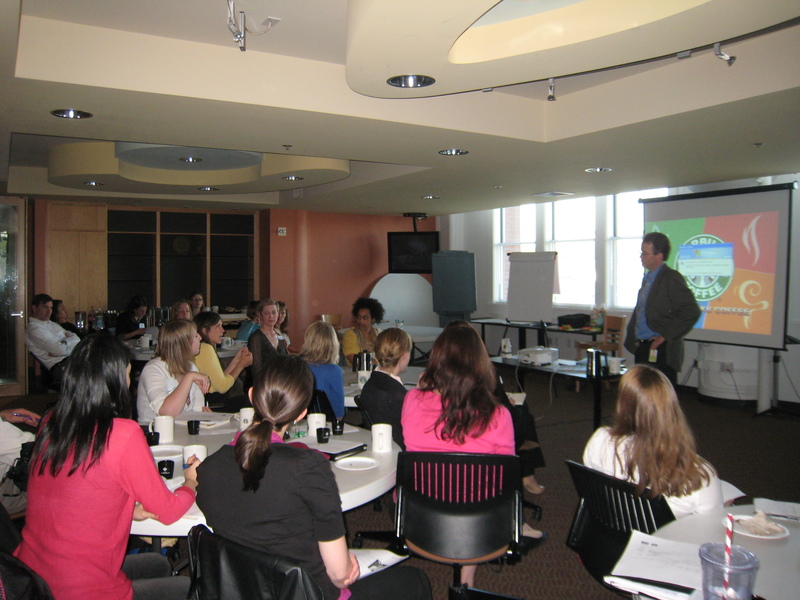 Net Impact Professional Chapter hosted “Starbucks in Focus” at the Starbucks headquarters on Thursday, May 12. 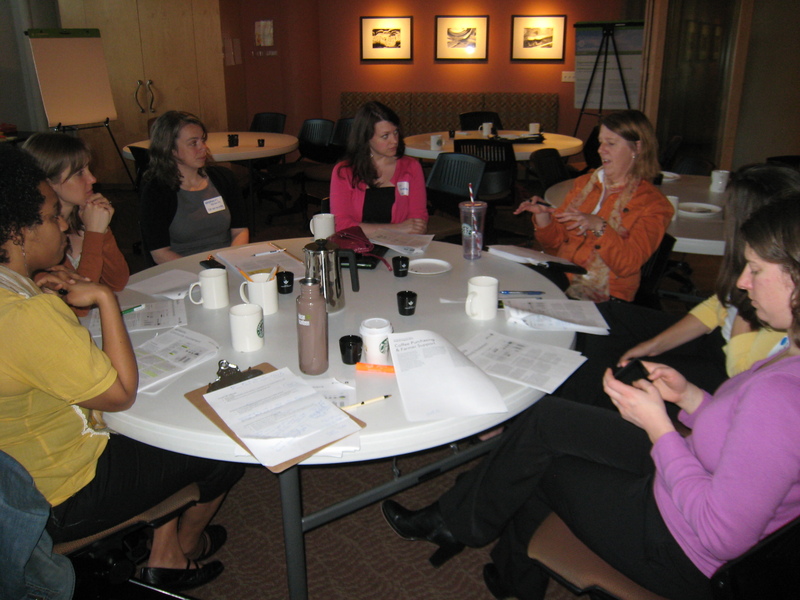 The discussion focused on the tenth annual Global Responsibility Report (FY2010) that was released in April. The Vice President of Global Responsibility, Ben Packard, provided a history of Starbucks’ CSR reporting and discussed key issues before we broke off into three sessions in which Net Impact members provided feedback to the Starbucks’ CSR staff. If you read the report, you’ll see that Starbucks is pretty transparent about their successes and their shortcomings in the corporate responsibility space. While some consumers attack them for their shortcomings, I appreciate their candor and their willingness to state ambitious goals and attempt to reach them. According to Packard, such candor wasn’t always easy. One of the biggest initial challenges was in creating internal alignment on the importance of responsibility reporting and convincing executives that such reporting was a good idea. Naturally, no company wants to open itself to criticism by disclosing unnecessary information. But Starbucks was one of the first companies to take the risk to begin reporting on their responsibility goals and progress in 2001. According to Packard, the benefits have been enormous. First, the report provided the opportunity to engage in the conversation about responsibility both within Starbucks and with their stakeholders: suppliers, customers, shareholders, competitors, etc. Second, after producing the report, Starbucks soon discovered that their customers really did want to know where they were headed. Such reporting helped to build loyalty among their customers and shareholders while creating alignment within the company. Third, Packard said that they discovered that it was okay to talk about their aspirations, even without a clear path for achieving them. In doing so, they found collaborators who were willing to help them to achieve their goals. For example, when Starbucks found LEED certification too difficult to pursue because it applied only to individual buildings, Starbucks worked with the U.S. Green Building Council (USGBC) and other retailers on the LEED Volume Certification Pilot, to create certification for large retail chains. And as Starbucks has been expanding globally, USGBC’s LEED program has helped create requirements that can apply in non-Western contexts. Several of our members wondered why the Starbucks’ 2010 report was so brief and did not employ GRI reporting standards. Rather it reported only on the goals that Starbucks set for themselves. Ben addressed this question by expressing his concern that consumers wouldn’t read a detailed report. GRI standards can be detailed and dry. For that reason, Starbucks has limited the length of their report. Perhaps because I’ve spent my working life as an academic, reading dry books and sorting through detailed data, I disagree with this perspective. I found the report too superficial. It gave the appearance of a marketing tool rather than a serious responsibility document comparable to a fiscal report. Such reports—by their nature—provide extensive metrics that should help shareholders and stakeholders gain an in-depth understanding of the issues and hard data. In fiscal reporting, detailed requirements are in place to create transparency. When a report lacks supporting data and does not comply with industry standards (albeit recent and evolving standards), it raises the question of either egocentricity (that they only abide by their own goals and not industry standards) or lack of transparency. One thinks about the C.A.F.E. Practices that Starbucks has created for coffee purchases. I’ve examined these standards in some detail and in many cases, they are far more innovative and effective than the Fair Trade approach. Yet by employing their own standards, Starbucks created confusion for the consumer. Just this week, I was sitting in a meeting in which a prominent, knowledgeable non-profit leader in the region criticized Starbucks because only 1% of their coffee is Fair Trade. I provided more information about the C.A.F.E. Standards in an effort to convince her that Starbucks is not avoiding their responsibility. Yet her comments were reflective of the the misunderstanding that can be created by an independent approach. I believe Starbucks would do well to provide a more detailed reporting structure. They are a company that is respected globally for working to integrate social and environmental responsibility into every aspect of their operations. They’ve worked to push industry standards to new heights, in a context in which green-washing is rife. One would hope that they’d continue to lead by employing a rigorous reporting structure like GRI that examines operations systemically and highlights blind spots as well as progress. By submitting themselves to such a standard, they’d also call green-washing companies to account. If industry standards like GRI are used well, they can help to break down the silos within large companies by forcing conversation and collaboration on social responsibility with the highest levels of management, from ethics and compliance to operations to finance. Because the reporting is so extensive, it has the potential to bring leaders to the table to work on issues systemically. While I would want to see a company like Starbucks continue to set new goals with creativity and courage, GRI can be employed to make sure that in blazing a new trail they are not blind to basic dangers that threaten every journeyman (and woman) moving toward responsibility. My suggestion to Starbucks would be to provide a glossy executive summary with attractive pie charts and graphs about their goals at the beginning of their report, for customers who want a simple overview. Then provide more detailed and in-depth GRI metrics to assess the progress more systematically. Such an approach would provide the PR and branding piece for customers while also providing peers, investors, and other stakeholders a deeper look into the operations at Starbucks. Certainly, many will not read the entire report. When I see such reports, I myself don’t read them in their entirety. But I do read and learn a great deal from the parts that are of most interest to me. Starbucks has a wonderful story to tell that includes their history, their successes and challenges, and their aspirations for the future. They are blazing a trail and we respect them for it. With more rigorous reporting mechanism, we would also be able to see how they’re journeying toward responsibility at every level of the organization. This entry was posted in Companies in the Puget Sound, CSR Theory, Ethics and tagged Ben Packard, CSR, CSR Reports, CSR Seattle, Net Impact, Net Impact Seattle Professional Chapter, Responsibility Reporting, Starbucks, Starbucks Global Responsibility Report 2010, Twitter. Bookmark the permalink.